A lot was expected of the Indian top-order batsmen on day 1 but everyone except Chesteswara Pujara failed to make a significant contribution to the team's total. Thanks to the gritty century from India's No.3, India were 250-9 at the end of the first day. The last Indian batting pair of Mohammad Shami and Jasprit Bumrah did not trouble the Australian bowlers as the former got out off the very first ball of the day. 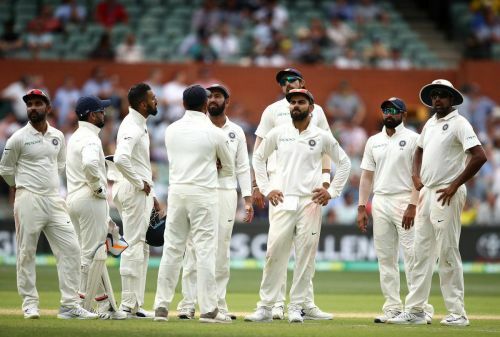 With what seemed to be a sub-par first innings total of 250, India needed their bowlers to step up and they did exceedingly well for the most part of the innings. In the first over of the Australian innings, Aaron Finch nicked back onto the stumps off the bowling of Ishant Sharma. The Indian bowlers, who were consistent with their line and length, reduced the scoring rate to a large extent. Just before the end of the first session, Ravichandran Ashwin ended a budding partnership between Marcus Harris and Usman Khawaja. By dismissing the debutant before lunch, Ashwin ensured that India went into the break on a positive note. In the second session, the off-spinner accounted for two more wickets. After Shaun Marsh gifted his wicket to him, Ashwin also sent the settled Khawaja to the pavilion before Tea. With tea ended Ashwin broken 22-over spell as Virat Kohli decided to introduce pace from both sides and was instantly rewarded. While Bumrah got the wicket of Peter Handscomb, Ishant sent Australian captain Tim Paine to the pavilion. By scoring his first half-century at home, the last recognised Australian batsman, Travis Head ensured that the home team did not concede a huge lead to India. He put together a crucial 50-run partnership with Pat Cummins for the seventh wicket. The crucial breakthrough was provided by Jasprit Bumrah as he dismissed Cumins after the introduction of the second new ball. After that, Travis Head along with Mitchell Starc stopped the Indian bowlers from picking any more wickets. At the end of Day 2, Australia trail India by 59 runs with three wickets in hand. It will be interesting to see if Indian bowlers can wrap up the tail early in the morning on Day 3 or their problem with the tail persists as it did in England. Pant behind the wickets screaming: Everybody is not Pujara guys!